List of African-American employees in the USDA Bureau of Animal Industries. John C. McLeod, $1800 per annum, Cincinnati, O.
Cornelius V. Lowe, $1620 per annum, Kansas City, Kans. Louis E. Baxter, $1400 per annum, New York, N. Y.
Frederick D. Halsey, $1400 per annum, Nat'l Stock Yards, Ill.
Thomas M. Higgins, $1400 per annum, Chicago, Ill.
William W. Fortner, $1200 per annum, Cleveland, O.
Roddy K. Moon, $1200 per annum, Cleveland, O.
Joseph A. Smothers, $1200 per annum, Brooklyn, N. Y.
Johnnie W. Webb, $1200 per annum, Houston, Tex. James M. Whitney, $1200 per annum, New York, N.Y.
Joseph Hall, $1100 per annum, Nat'l Stock Yards, Ill.
George W. Rivers, $1100 per annum, Chicago, Ill.
Robert L. Scott, $1100 per annum, So. St. Joseph, Mo. Walter L. Seals, $1100 per annum, So. Omaha, Nebr. William E. Coffey, $1000 per annum, Wichita, Kans. Thomas W. Doubley, $1000 per annum, Newark, N.J.
Ernest P. Fagan, $1000 per annum, Kansas City, Kans. Robert B. Hawkins, $1000 per annum, Chicago, Ill.
George T. Laster, $1000 per annum, St. Louis, Mo. William G. Miller, $1000 per annum, Nat'l Stock Yards, Ill.
John H. Neal, $1000 per annum, Brooklyn, N. Y.
William T. Stewart, $1000 per annum, So. Omaha, Nebr. Walter C. Maxwell, $900 per annum, Nat'l Stock Yards, Ill. Page Anderson, $840 per annum, Nat'l Stock Yards, Ill.
Fred D. Arrington, $840 per annum, Newark, N. J.
Roy E. Barnett, $840 per annum, So. Omaha, Nebr. Daniel M. Batteau, $840 per annum, Sioux City, Iowa. Andrew L. Bell, $840 per annum, Cleveland, O.
Emmet B. Burke, $840 per annum, Chicago, Ill.
Solomon G. Burke, $840 per annum, Nat'l Stock Yards, Ill.
Jeby Caston, $840 per annum, Nat'l Stock Yards, Ill.
John A. Echols, $840 per annum, Fort Worth, Tex. Charles Favors, $840 per annum, Oklahoma, Okla.
Jesse Hampton, $840 per annum, Oklahoma, Okla.
George B. Hawkins, $840 per annum, Chicago, Ill.
Albert L. Imes, $840 per annum, Cincinnati, O.
Levi Nelson, $840 per annum, Chicago, Ill.
Albert Seay, $840 per annum, Cleveland, O.
Edgar D. Stephens, $840 per annum, Chicago, Ill.
Benjamin G. Steward, $840 per annum, Chicago, Ill.
Thomas L. Wallace, $840 per annum, Oklahoma, Okla.
Jesse Wilson, $840 per annum, Chicago, Ill.
Walter D. Benton, $1200 per annum, San Diego, Cal. William Jenkins, $1200 per annum, San Francisco, Cal. William F. Neil, $1200 per annum, So. St. Joseph, Mo. Artemus Irving, $1100 per annum, Chicago, Ill.
John O. W. Alexander, $1000 per annum, St. Louis, Mo. Charles S. Matthew, $1000 per annum, Kansas City, Kans. John Nicholas, $720 per annum, Washington, D. C.
Charles Wesley, $720 per annum, Washington, D. C.
Philip S. Miller, $4 per diem, Beltsville, Md. William R. Reed, $600 per annum, San Francisco, Cal. #1 James R. Stafford, $900 per annum, Kansas City, Kans. Walker A. Brewer, $840 per annum, Jersey City, N. J.
J. D. Wiseman, $720 per annum, Beltsville, Md. William H.. Shields, $720 per annum, Washington, D. C.
Richard Epps, $660 per annum, Washington, D. C.
Frank Mathews, $660 per annum, Bethesda, Md. Joel M. Jones, $600 per annum, Washington, D. C.
Jacob Leftwich, $600 per annum, Bethesda, Md. James Samuel, $600 per annum, Bethesda, Md. George Frank Coleman, $540 per annum, Bethesda, Md. Frank Lancaster, $540 per annum, Bethesda, Md. Sam Mason, $540 per annum, Bethesda, Md. Walter E. Adams, $480 per annum, Beltsville, Md. John L. Banyon, $480 per annum, Bethesda, Md. Elisha Brewer, $480 per annum, Beltsville, Md. James N. Brewer, $480 per annum, Beltsville, Md. Samuel Israel Crump, $480 per annum, Beltsville, Md. Augustus Gaither, $480 per annum, Beltsville, Md. William Gaither, $480 per annum, Beltsville, Md. Edward T. Gross, $480 per annum, Beltsville, Md. Joe Hipkins, $480 per annum, Bethesda, Md. Robert Andrew Jackson, $480 per annum, Beltsville, Md. John Henry Jones, $480 per annum, Beltsville, Md. William Jones, $480 per annum, Beltsville, Md. Naylor Lancaster, $480 per annum, Bethesda, Md. John Thomas Parker, $480 per annum, Beltsville, Md. J. H. Purnell, $480 per annum, Beltsville, Md. Charles Thomas Robinson, $480 per annum, Beltsville, Md. Gus Ross, $480 per annum, Beltsville, Md. Gus Ross, sr., $480 per annum, Beltsville, Md. Alphonso White, $480 per annum, Bethesda, Md. William Brooks, $480 per annum, Bethesda, Md. Cleave Clipper, $480 per annum, Bethesda, Md. Will Clipper, $480 per annum, Bethesda, Md. William H. Drummonds, $480 per annum, Bethesda, Md. William Henry Garrett, $480 per annum, Washington, D. C.
Dave Hawkins, $480 per annum, Bethesda, Md. Allen Holmes, $480 per annum, Bethesda, Md. William James, $480 per annum, Washington, D. C.
William Mason, $480 per annum, Bethesda, Md. Roy Myers, $480 per annum, Washington, D. C.
Granville White, $480 per annum, Bethesda, Md. John Wesley Brewer, $1.50 per diem, Beltsville, Md. Edward Dixon, $1.50 per diem, Beltsville, Md. Frank Mathews, $1.50 per diem, Beltsville, Md. William Tolliver, $1.50 per diem, Beltsville, Md. Ambrose Jackson, $8.00 a month, Front Royal, Va.
Emma J. Atkins, (Mrs.), $480 per annum, Washington, D. C.
Mary L. Hughes (Mrs.), $480 per annum, Washington, D. C.
Senia W. Madella (Mrs.), $480 per annum, Washington, D. C.
Cora M. Ridley (Mrs.), $480 per annum, Washington, D. C.
Emma J. Winfield (Mrs.), $480 per annum, Washington, D. C.
Fannie E. Winfield (Mrs.), $480 per annum, Washington, D. C.
Birdie Addison (Miss), $360 per annum, Kansas City, Kans. 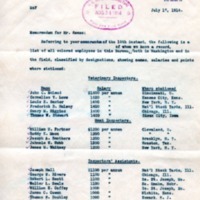 Ella F. Elliott (Mrs.), $360 per annum, Chicago, Ill.
Willie E. Jordan (Mrs.) $300 per annum, Washington, D. C.
Isabel Nance (Mrs.), $360 per annum, South Omaha, Nebr. #1---With additional compensation at the rate of $20 a month for the use of a horse and wagon owned by him and furnished to the Department in the discharge of his official duties. Carroll, Charles C., “CC Carroll to RM Reese,” 1914 July 17, DA071714, Race and Segregation Collection, Woodrow Wilson Presidential Library & Museum, Staunton, Virginia.